We’re always on the lookout for new places to explore, especially if they’re easily accessible via bicycle, our favorite way to get around. With that in mind, we examined the pedaling possibilities in Sacramento. It turns out that California’s capital is quite a cycling city. 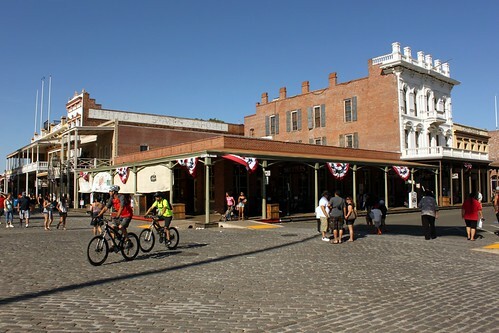 In no time at all, we figured out that near the river in Old Sacramento was the place to stay for bike enthusiasts like us. We found all kinds of great hotels in the old town, along with several good places to rent bikes. The entire area is protected as a State Historic Park and a National Historic Landmark District. Harkening back to the gold rush days, the boardwalk-lined streets cover 28 acres along the waterfront. Much of the area is open to pedestrian and bicycle traffic only. Should we feel the need for alternative transportation, stagecoaches still clatter across the cobblestones, and steamboats still whistle on the river. The original ground level of Sacramento remains hidden beneath the surface. After devastating floods in the 1860s, rather than move the city, the residents raised it. In an amazing feat of engineering, the street level was brought up by 13 feet. Old Sacramento’s forgotten basement is part of the Sacramento History Museum, which, along with the California Automobile Museum, Maritime Military Museum, Wells Fargo Museum, Schoolhouse Museum, and the California State Railroad Museum, has revitalized the historic center of California’s oldest incorporated city. As a well-documented train nut, David is by far the most excited by the last on that list of attractions. 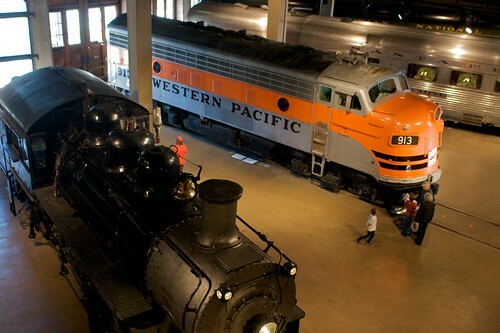 Not only can he get the scoop on the first transcontinental railroad and the rich history of railroading in the Golden State, but he can also take a ride behind a live steam engine on the Sacramento Southern Railroad. But biking is our inspiration, and the city is remarkably bike friendly with an incredible array of lanes, trails, and paths dedicated to those of us who prefer to get around on two wheels. Of these many trails, two stand out. Officially known as the Jedediah Smith Memorial Trail — a name we know from a prior visit to the redwood forests in northern California — this trail is Sacramento’s most popular. Here, old Jed begins in the historic district and runs 32 miles north and east along the American River to Folsom Lake. This is the granddaddy of bike paths, as it dates back over a century. It wasn’t long before automobiles became commonplace, and the trail was left to overgrow. In the 1970s it was resurrected and paved, and now it’s used by about 5 million people each year. A highlight lies a few miles east of Old Sacramento, where the Guy West Bridge spans the river on the campus of California State University, Sacramento. 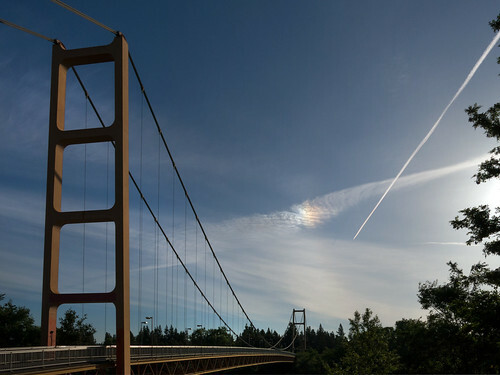 The suspension bridge was designed as a miniature Golden Gate, right down to the international orange paint job. This is a rail trail, our favorite kind. 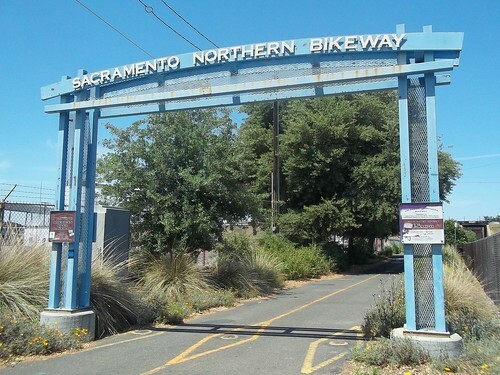 It uses the former right-of-way of a railroad, in this case the Sacramento Northern Interurban Railway. We love these because they are always very level and often incorporate many of the cool bridges, tunnels, and structures from their train track days. The bikeway breaks off to the north from the American River Trail and runs 10 miles up to Rancho Elverta. This allows for a little glimpse of the suburban countryside around the city. Now that we know what a cycle-centric city Sacramento has become, all that’s left is for us to pack our bags. We were happy to write this in collaboration with hotelplanner. Glad to see awesome representation of my hometown, SacTown 🙂 There’s even a connected trail that will take you all the way to Davis.